Professional paint chip touch-up can help you hold back the hands of father time. 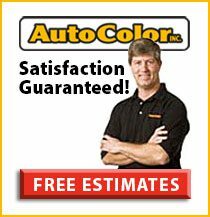 Color matching, precise paint application and multiple techniques depending on your situation can greatly improve the appearance of your vehicle. This type of car paint repair is a specialty of Auto Color’s and saves our customers a great deal of money compared to traditional body shop repairs.